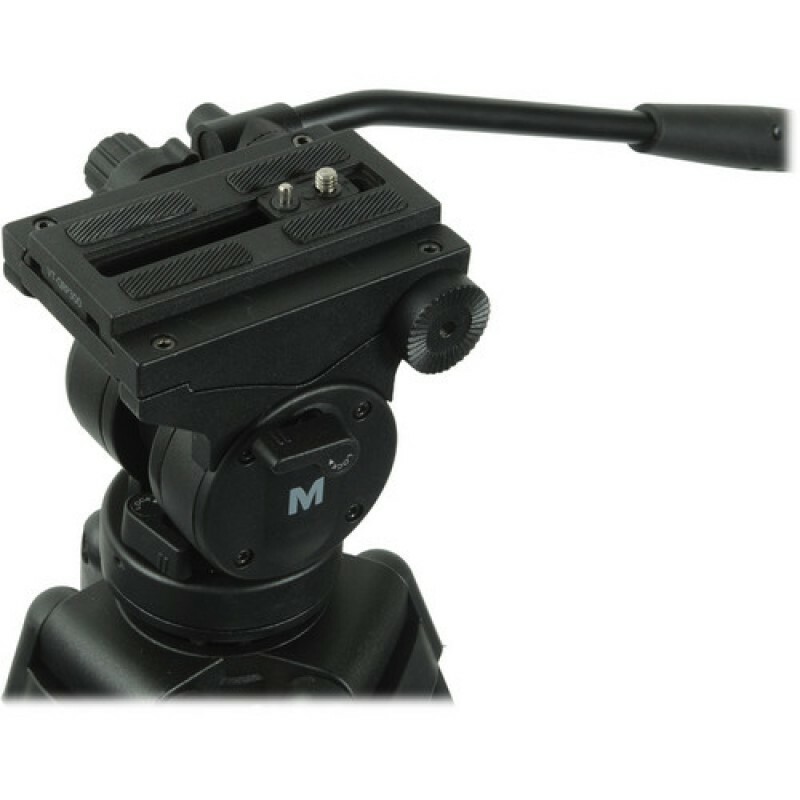 The sturdy Magnus VT-3000 Tripod System with Fluid Head is a stable camera support made from anodized aluminum that supports up to 6.6 lb. It has many features commonly found on more expensive models. The two-way fluid head provides smooth operation, and features a half-ball mount with a diameter of 65mm, with left and right pan bar mounts. One pan bar comes included. The VT-3000 tripod system weighs 7.75 lb. 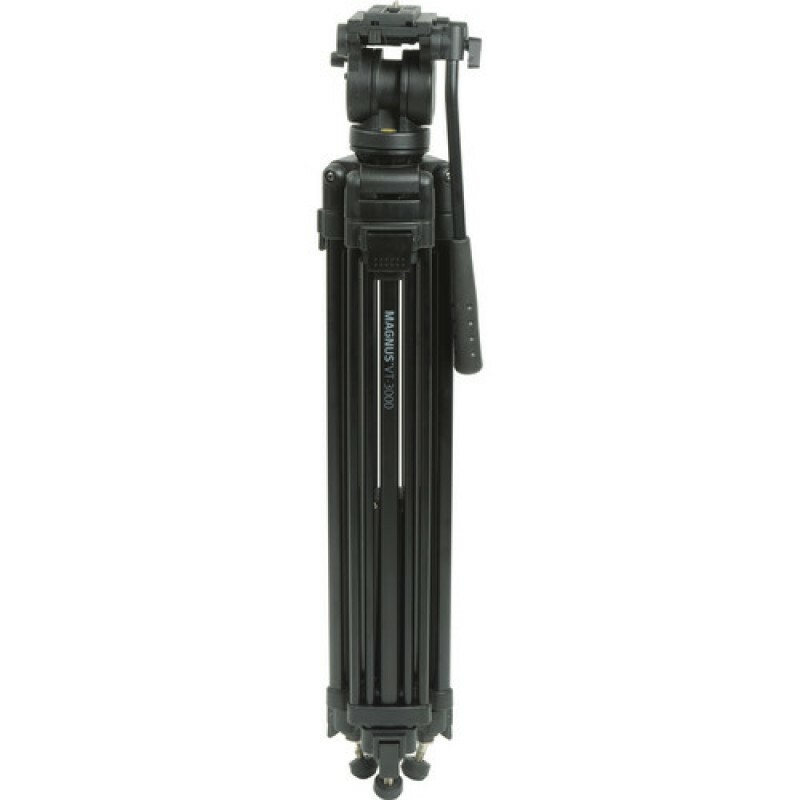 The 3-section leg design allows you to adjust the height of the tripod from 28.6" to 61". A mid-level spreader and passive counterbalance provide improved stability. The VT-3000 has separate pan and tilt locks and a bubble level for precise leveling, and offers a full 360° pan range. A fixed counterbalance spring incorporated into the head provides smoother tilt movements. 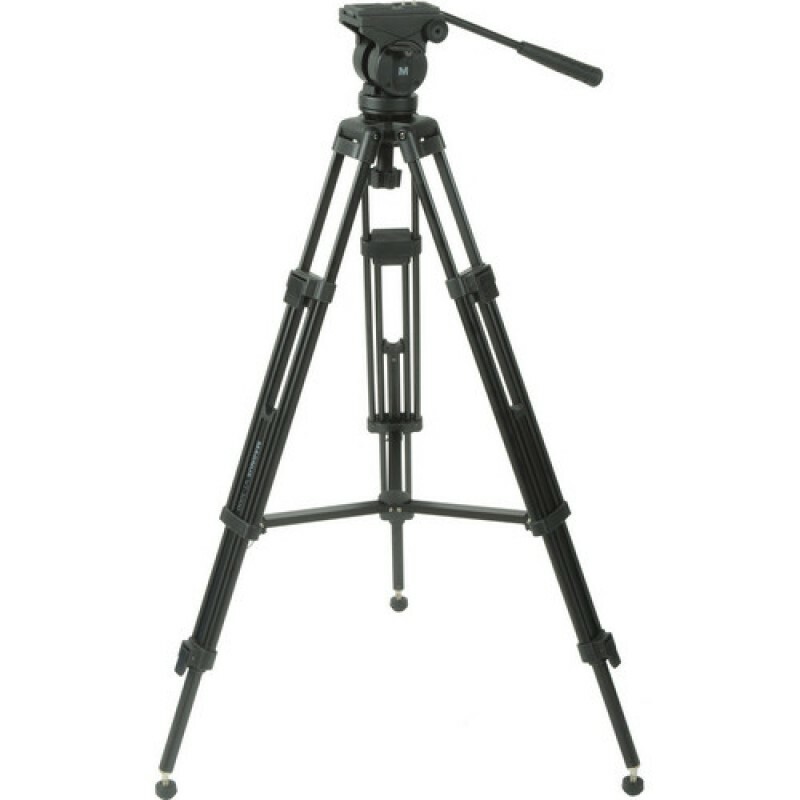 The height of the tripod is adjustable from 28.6" to 61"
Box Dimensions (LxWxH) 32.2 x 6.3 x 6.1"
Sturdy tripod with a smooth swivel- Gets the job done. It is sturdy enough to hold a mini jib crane on it, you just need to add some weight with a sandbag or two to keep it from tipping over. Only cons are that it is a bit heavier than I would like and when you pan vertically you have to maintain pressure on the pan bar. If you release it before locking it, it will slowly start to return to level. Overall I would recomend this to a friend. I mostly needed a tripod for interviews on a small television channel but I was not sure which one was right for me. The experts at iStockOnline listened to my exact needs and gave me appropriate recommendations. The chat feature is awesome and the service was quick and polite. After I decided to order it I chose the one day shipping and it came the very next day with no processing time! The tripod itself is exactly what I needed. Build quality is excellent . The ball head is fluid and smooth. It is also very lightweight and great if you are constantly re positioning it or carrying it around. At this price you will not find a better tripod and I definitely recommend it. This tripod is very strudy and sure to last a very long time. It is builty solidly with durable material and the matte black is sleek and professional. I enjoy using the pan and tilt they operate smoothly, setup is also a breeze the tripod height is adjustable from 28.6" to 61" and the built leveler makes the setup even easier. It would be nice if the tripod were a bit lighter but I prefer an extra pound or two and the increased durability that comes with it. Needless to say the price is amazing. This product gets two thumbs up. This product is recommended. I usually don't buy my equipment online but I was extra busy and I didn't have time to get to B&H so I took a chance with iStockonline and I was not disappointed. It has nice motion and maneuverability for a low price. I am very impressed. The head is smooth and vertical and horizontal panning is easy. This is my first time ordering something from magnus and I must say I am impressed. Also,if you are ordering camera equipment online iStockOnline is certainly the best. Their service is always fast and their shipping has never let me down. Thank you! I use this for a small film I am shooting and I have gotten some incredibly smooth shots. The tripod is also sturdy. An all around great buy I am excited to add this to my equipment. I got this tripod a month ago and I have had no regrets. It is built with high quality materials and has a lovely matte black finnish. iStockonline also shipped it faster than the estimated shipping. This tripod strikes the perfect balance between light and sturdy. I don’t understand how magnus managed to make it so light while still keeping the feel and sturdiness of much heavier equipment. I have been a photographer for almost three decades now and, for the money, this is the best piece of video equipment I have ever seen. I use this with my panasonic AG-AC90 and I have gotten some superb shots over the last few months. The movements are fluid and the range of motion is top of the line. The only reason I am not giving a fifth star is the pressure you put on moving the ball head takes some getting used to. After the first week I was fine but before that I was jerking it a little bit. Overall this a top notch tripod that will probably steal your heart as well. I use this tripod with my Sony HVR-V1U and I love it. The head gives me very smoothe shots and the weight is heavy enough to not feel crappy or breakable. Magnus really did a great job with this ball head. Out of any ball head I own this is the least expensive yet also the best quality. The pan/tilt locks are strong and the sliding plate is a great feature that makes my fixed plate tripods seem cheap in comparison. 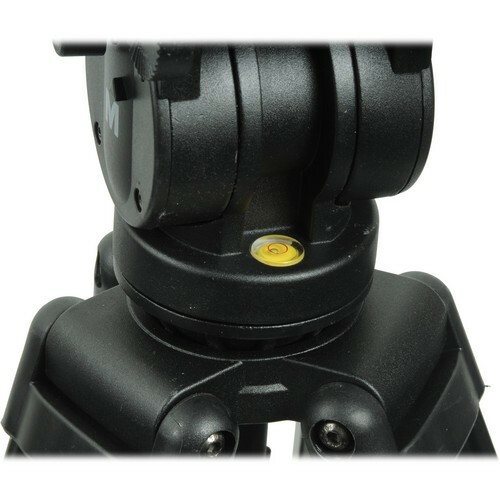 The mounting head is also easy to use especially considering the price of this ball head. I also like the look of this piece, it has an attractive black finish that looks great and makes the tripod seem much more expensive than it actually is. Overall I have thoroughly enjoyed this product and I believe it is a good buy. I use a tripod outside and sometimes in very stormy conditions. This tripod holds its own with out making me break my back when I pick it up. (I think I got back pains from my last one.) All around good buy. I also would give five stars to magnus items in general. I have had great experience with their items and they are usually well priced.